Getting back to the Horus Heresy after a somewhat lengthy break was easier than I thought it would be, helped greatly by how good this novel was. 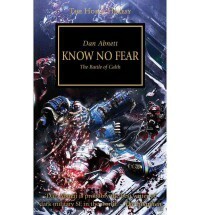 Dan Abnett, to me, has been one of the leading writers in the WH40K galaxy, and this book again proves just how good his novels are. Unaware of the treachery of Horus Lupercal, the Ultramarines and their primarch, Roboute Guilliman, prepare for war with orks in the Ultramar system. Their supposed ally in this battle, the Word Bearers and their primarch, Lorgar, have different ideas. Following the traitorous Horus, Lorgar and his legions attack Calth and the Ultramarines in what can only be surmised as the ultimate betrayal. Abnett's descriptions of the battle both on the surface and in orbit of Calth are outstanding. He also once again does an excellent job with characterization of factions of the Ultramarines and Word Bearers. The reader can feel the emotions leaping off the pages as the battle ensues. I would definitely put this one among the top 3 of the Heresy novels I have read so far....well written, fast-paced, and an emotional roller-coaster as well.